Art Deco was a style that one could wear: luxurious furs, long gowns, three piece suits, and accessories for women and men were just a few of the means to display one's sense of taste and fashion. Eaton's was one of Montreal's leading department stores and catered to a wide clientele. It operated a successful catalogue service through which orders could be placed by telephone or sent by mail. Other stores catering to Montreal's elite were a block away from Eaton's on Phillip's Square; Henry Birks and Sons specialised in fine jewellery and table wares and Henry Morgan and Co. (now The Bay) featured fine goods from Europe. A travel brochure of the Canadian Pacific Cruises Round the World Tours by Canadian Pacific Railways, 1927-1928. The cover of a brochure for ocean liner travel, 1925. The cover of the anniversary issue of the Cunard Line of Ships, 1929. Lithographed cardboard poster for Cunard Lines, ca. 1930. A foldout publicity card of a tourist third cabin room on Cunard Line, 1926. An advertising booklet for Tourist Third Cabin, Cunard Lines, ca.1925. The cover of a catalogue of tea service sets from Henry Birks and Sons, Silversmiths, Montreal, 1929. The cover of the Eaton's Fine Gifts catalogue for Christmas 1934. The cover of the spring catalogue entitled Eaton News spring fashions, highlighting new fashions, dated March 29, 1930. The cover of the Brodie Tailoring Company's catalogue featuring "tailored-to-measure" clothes entitled What Well Dressed Men Will Wear. 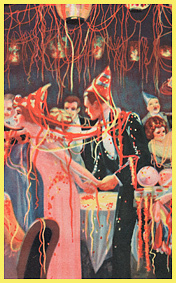 The cover of the menu of the Mount Royal Hotel, New Year's Eve, 1925. The cover of the menu of the Picadilly Club, Mount Royal Hotel, ca. 1930. The cover of the menu of the Ritz Carleton New Year's Eve Supper, Montreal, 1923-24. The cover of the travel brochure and Montreal tunnel terminal map and schedule entitled Direct to the Laurentians from Montreal. The cover of a promotional brochure describing winter sports in Montreal in 1924.